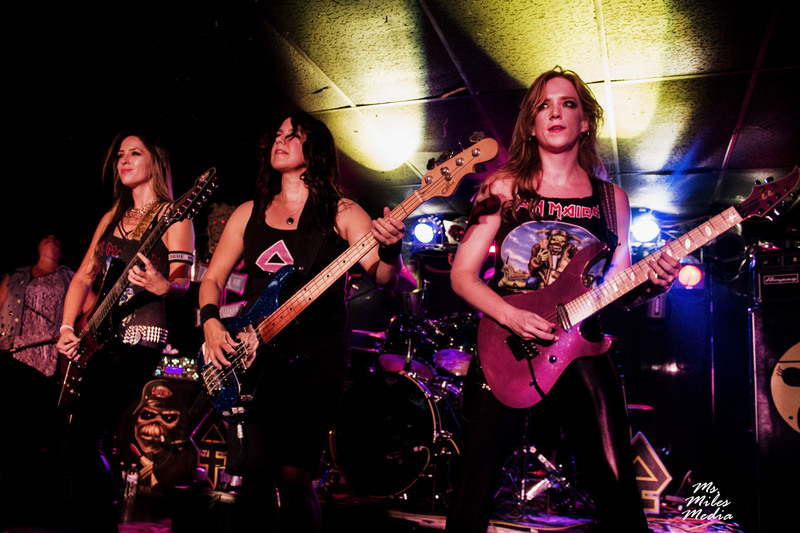 Friday, Aug. 10 was a night of tributes at The Scene in Kansas City as all-female Iron Maiden tribute band The Irons Maidens brought their amazing talent, Edwina, and all the best Maiden tunes to town. Locals ElectroPossum and Revolution Calling joined the group for a night of throwback tracks. ElectroPossum started off the night on the outside stage with a set featuring both originals and covers. Guitarists Jared Dagley and Jacob Henson, drummer Chris Richards and bassist Derek Muller all come together to share vocals. The group has a look of four music teachers who’ve come together to form a band. “The bass player looks like one of my teachers,” said CMN photographer Lexi Miles. The Excelsior Springs, Mo., natives are heavy in the talent and rock a great show. No bells, no whistles, just four great musicians with great songs who even throw down on a couple of great cover tunes including some Alice in Chains. Their set included tracks “Squirt Bikes” and “Song,” both of which you can find on SoundCloud. like they are at a Queensryche show. With their fantastic renditions of amazing tracks from the Queensryche library, they do just that. Close your eyes and you think you are listening to Tate and the boys in a big arena. Revolution Calling consists of Rhaunie Dekiro as Wilton, Ryan Repking as DeGarmo, John McCarthy as Jackson, Olly Oliver as Rockenfield and Jay Holliday as Tate, the front man himself. While they attempt the look and style of Queensryche and concentrate heavy on the “Operation Mindcrime” days, it’s their talent that brings the music to life. Fans might not be able catch the real Queensryche, but they can catch their music brought to new life through this band of obvious fans and great musicians. The time had come to head inside to the main stage for The Iron Maidens, the one and only all-female Iron Maiden-endorsed tribute band. The world famous Maidens are the most popular tribute band of the time and it’s because of the immense talent these ladies possess. Taking on the daunting task of portraying such an iconic band is no small feat and the Maidens crush it. Covering the roles of Adrian Smith and Dave Murray on guitars are the powerhouse duo of Courtney Cox and Nikki Stringfield. They bring a new and amazingly different energy to some blistering solos, which they lay down like the gods themselves. Linda McDonald takes on the role of Nikki McBurrain on drums and with her enormous personality and extraordinary stick skills, she brings her kit to life and is a show all on her own. Filling what might be the most important role of front man Bruce Dickenson is Kirsten Rosenberg. Rosenberg is perfect in the position with a vocal range and power ideal for the infamous “Scream for me Kansas City.” With her added costume changes, she lives the role and makes it her own demon. Wanda Ortiz is tasked with bringing to life the heartbeat and father of Iron Maiden, the “gallop” master himself Steve Harris. Ortiz is nothing short of spectacular and when she thumps her bass you feel it in your soul. Ortiz brings the “gallop” that Harris is known for in full stride and has a stage presence unmatched even by father Harris himself. Throw in the appearance and several incarnations of the historic mascot Eddie, including a surprise visit from the crowd, and the show had all the makings for a truly magical and breathtaking performance. The Iron Maidens have produced some phenomenal artists with explosive talent and the current line up might very well be its very best to date. During a frustrating sound check, the ladies first showed their almost effortless command of the material, but later experiencing it in all its glory was epic for the audience, to say the least. The Maidens have dates through the end of October and are a definite must see. If given the chance, a bonus is seeing them in a small venue where they make the effort to see the fans for autographs and pictures after the show.